Posted on April 1, 2016 April 1, 2016 by Norte! Yay, April! We are so so so excited to ride bikes, sling buckets and get our hands dirty again. This will be our 5th season of bike-powered community composting and we’re fired up to get going again. 1. We give you a bucket. 3. A week later, we’ll pick-up your scraps with our bike trailers and leave you a clean bucket. 4. We’ll dump your organic waste into my pile or worm bin here at C’sC World HQ, or into one of our Neighborhood Compost Stations and backyard “sharing” piles. 5. We then mix in some carbon aka”browns” to keep the pile balanced and lovely. Not too wet. Not too dry. Just right for the trillions and trillions of mirco-organisms to do their thing. Turning it as needed to bring in oxygen so that the decomposers can breathe. 6. Once ready, I give you a five-gallon bucket full of our (your!) 100% awesome, locally grown compost so that you can use it in your garden to grow yummy veggies (or pretty flowers!). If you don’t need the finished compost, we will donate it to a neighbor or community/school garden. The cost? 10 dollars per month. Yep, that’s right, just 10 bucks for weekly bike-powered pick-ups. Special early bird, errrr, worm deal for $60: Sign up in April, pay for the entire season in advance and get April and May’s pick ups for free. Yes, FREE! The very, very kind people at Taste The Local Difference will once again be sponsoring C’sC this season. Their generosity allows us to keep the cost of our weekly pick ups just $10/month. Awesome, right? Thank you for and supporting bike-powered community composting in Traverse City, TLD. We love ya. Learn more about how Taste The Local Difference “is helping food businesses and the communities they serve benefit from the economic value of local food, while ensuring that fresh, healthy, local food is available to all consumers” HERE. Posted on August 5, 2015 August 5, 2015 by Norte! Editor’s note: The awesome MYOI crew joined us again for some compost making and bucket slinging last week. Here’s a highlight of our day from MYOI Coordinator, Tim Bottrell. MYOI is a state run program that works with current and former foster youth ages 14-23. As coordinator of MYOI (Michigan Youth Opportunities Initiative) in Grand Traverse/Kalkaska/Leelanau Counties, it is my job to find educational experiences in our community that focus on transportation, finances, health, education, housing, employment. Another big part of what we do is getting involved in our community and giving back to the community who supports us. One of my favorite annual events is our visit to Carter’s Compost to help Carter, his dad Ty, and little brother Jamo. It’s the one day a year that our youth are able to take part in an event that hits on every single aspect of what MYOI is about. We focus on health and affordable transportation by hitting the town on bicycles to get some exercise, smile, and practice safe biking. We gain valuable work experience by picking up buckets of kitchen scraps from customers, rotating the piles at Oryana’s Neighborhood Compost Station, and screening worm castings from Grand Traverse County‘s Vermitech that’s housed at C’sC World HQ. We also learn about creating your own job by hearing the simple story of an elementary kid who started his own business with the help of his family. Learning that most of Carter’s earnings go to his college savings relates to our program focus of saving and pursuing education. Not to mention the lesson of turning old food into new food through composting and gardening. Perhaps the biggest take away from our day with Carter’s Compost is how everything ties into community. They see that Carter’s Compost can’t exist without community, and that Carter’s Compost builds community. Our youth see that they are an important part of this community, and they are able to give back to their community. Posted on May 4, 2015 May 4, 2015 by Norte! Join us at Oryana, Saturday, May 16 from noon – 4pm for a community compost screening party. Compost parties are the best parties and this one is going to be happening right in the middle of Oryana’s Earth Day North festivities so it’s going to be extra special fun. 1. Bring some garden gloves at meet us at Oryana’s Neighborhood Compost Station anytime between 12-4. 2. Use our sifters to screen some finished compost. This isn’t just any regular compost, though. This is 100% awesome, neighborhood compost grown with love using neighborhood kitchen scraps and neighborhood leaves. It’s truly Traverse City Dirt. And your plants will LOVE it. 3. Put the screened compost into one of our buckets. 4. Take the compost home and use it in your garden. Use it to grow food to “Complete The Cycle”. This makes us happy. 5. Return our bucket to the Compost Station the next time you shop at Oryana. 6. Send us a photo of your garden when it’s in full swing to show off you neighborhood food grown with neighborhood compost. This will also make us happy. 7. Give yourself a pat on the back for supporting bike-powered community composting and helping to green Traverse City one bucket at a time. Oryana is hosting a fun afternoon for the whole family. Join us as we celebrate Earth Day with an extravaganza of demonstrations and presentations by our green-minded community partners, a variety of local vendors, and non-profit organizations. Make a day of it and participate in the North Lake Adventure. Have your passport stamped at Oryana or simply stop by the TART trailhead and join in the fun. Enjoy specials in Oryana’s Lake St. Café, a local food truck Pigs Eating Ribs, and free iced tea and water at the trailhead. Posted on April 20, 2015 April 20, 2015 by Norte! Northern Michigan has a lot of roadside, self-serve farmer’s stands. Farmer’s put their fruits and veggies out. People pay on the honor system. It’s cool. The Washington Street Neighborhood Dirt Market is very similar. Except instead of cherries and corn we sell compost. 100% awesome, locally grown compost. Compost that we grow with love right here at C’sC World HQ. Compost made entirely from our neighbor’s kitchen scraps and from the leaves off my neighborhood trees. We shovel and screen each bucket by hand. We think it’s pretty awesome. Your tomato plants will probably love it! 1 bucket per year is free for our current Carter’s Compost members. If you’d like more compost, you’ll have to come over and work for it. Screening dirt is fun! We sell the compost to non-members too. Just 5 bucks for a 5 gallon bucket full. The buckets will be out front. Come help yourself anytime but please return the bucket when you’re done with it. The Market is open for several weeks both in the spring and the fall. Email me (carterscompost@gmail.com) for directions to C’sC World HQ, specific dates and availability. We hope that you will use our neighborhood compost to grow neighborhood food! And then give yourself a High Five for being so awesome, Completing the Cycle, and supporting bike powered, youth-driven community composting! Posted on March 26, 2015 March 29, 2015 by Norte! Because sometimes you just have to get those kitchen scraps composted NOW! C’sC is excited to offer on demand/same day kitchen scrap pick-up using Square’s new Cash app. An easy, convenient service for those who may not need weekly pick-ups. Sign up for Square’s Cash service HERE. We’ll then drop-off a clean bucket and lid. You fill up your bucket with your kitchen scraps (no meat, dairy please). Full list of no-no’s HERE. When you’re ready for us to pick-up your bucket use your phone to send $4.00 to $CartersCompost via your Cash app. On that very same day, we’ll pedal over to pick-up your bucket, leave a clean one and then compost your kitchen scraps here at C’sC World HQ. Easy! Give yourself a pat on the back for reducing your waste and helping to make Traverse City greener than ever. On-demand service is only available in the Oak Park neighborhood at this time. Weekly pick-ups subscriptions also available for $10/month. Sign up HERE. Posted on March 10, 2015 March 19, 2015 by Norte! Spring has come early to Northern Michigan and we are so so so excited to ride bikes, sling buckets and get our hands dirty again. This will be our 4th season (Whaa!?! How is that possible?) of bike-powered community composting and, as always, we’re Dreaming Big. 1. Help make Traverse City the most compost-errific town in Michigan The Universe. 2. Help more (lots more!) 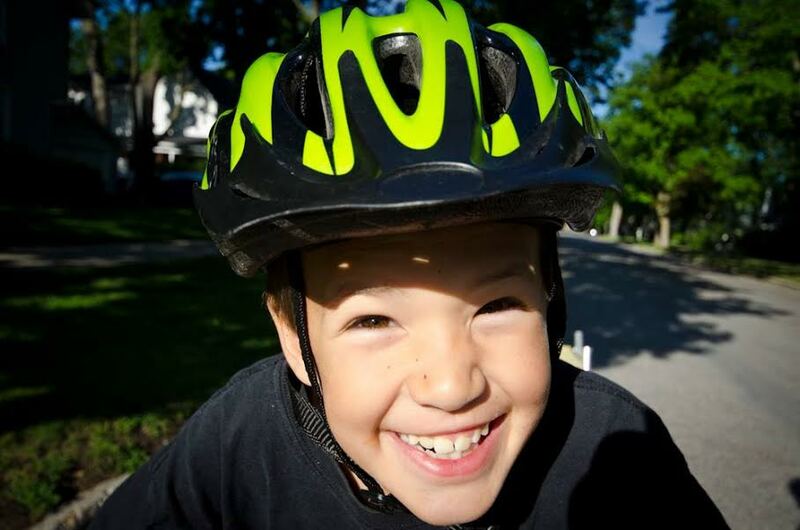 youth start bike-powered bucket slinging operations in their Traverse City neighborhoods. 3. Help build 100 community/”sharing” compost piles in Traverse City. 4. Ride bikes. A lot. 5. Create a compost-y Map. “TC as the most compost-errific town in The Universe sounds awesome. How can I help?”, you ask? 1. Become a Compost Champion HERE and commit to recycling your kitchen scraps. Grow Traverse City Dirt not Traverse City landfills. 2. Support your neighborhood Compost Boy or Girl. Like Amelia. Or Max. Or Noah and Elise. Or Jack. Or Katie. Or William. Or our newest SlabTown and Boardman bucket slingers, Kyan and Moses. They make composting super easy. Plus they’re awesome. Sign up HERE for weekly bike-powered pick-ups for just $10/month. 3. Share your pile. Because compost pile sharing is the best kind of sharing and a Traverse City that composts together, stays together. We’re at 19 sharing piles. Only 81 to go. More info on the power of pile sharing and how it works HERE. 4. Ride bikes with us sometime. Our sister project, Norte!, has grown up into a legit nonprofit advocacy organization. They are dedicated to building a more bike-friendly Traverse City by inspiring youth through bicycles. Norte! has lots of cool things happening. Check’em out HERE. 5. We’re also creating a map. An awesome map, actually. A map to help connect experienced/knowledgeable TC composters with our neighborhood bucket slingers and other TC neighbors who might not have the space or know-how to compost. All you have to do it is share it with at least on neighbor. Sound awesome? Sign-up to share your pile HERE and help us grow our map. Thanks for helping us to green Traverse City one bucket at a time by supporting bike-powered community composting. We’ll see you around the ‘hood this spring and, please, Compost On! Posted on November 27, 2014 December 7, 2014 by Norte! To the 648 respondents of our science fair compost survey. To MLUI for inviting us to live-auction a pie at their Harvest@theCommons. To Carter Oosterhouse and Amy Smart for buying this pie. To the lovely Ladies of the Washington Street Hennery. To Kohl’s Cares for their scholarship. To Max, Amelia, William, Katie, Jack, Noah, Elise, Jameson. Traverse City’s other awesome bucket slingers..
To Dirt Fest and NoMI Small Farm Conference for inviting us to present our Community Sustained Compost project. To Grand Traverse County RecycleSmart for honoring us with the 2013 “Take It Back” Recycler Of The Year. To TeeSeeTee for designing our Traverse City Dirt Tshirt. To So Delicious for their #140Difference grant. To BioBag for donating compostable bags and counter top compost pails to help classrooms de-landfill their snack scraps. To the 75 backers of our successful Kickstarter campaign. To the Friendly Garden Club of Traverse City for including us on their Garden Walk. To the now 150+ neighbors who have signed up for a bucket since we started in 2012. To our “pile sharers” for sharing their backyard pile with us and their neighbors. We’re currently at 28 and on the way towards our goal of 100. To the volunteer crew from AT&T for screening compost from Oryana’s Neighborhood Station on United Way’s Day Of Caring. To MYOI for slinging buckets and making compost with us. Youth-driven community compost! To the Grand Traverse Mycological Society for installing oyster mushrooms here at C’sC World HQ during the Radical Mycology Tour. To BioCycle Magazine for featuring us in their community compost article. To our Compost Friendly Businesses. To the 15 teachers at 10 different area schools for adopting our worms for the winter. To SEEDS/GT County Resource Recovery for loaning us their vermitron (a commercial scale worm bin) so that we could grow all these worms. To our always supportive Donors. To Brew, Cuppa Joe, and Morsels for supporting our #SaveTheCoffeeGrounds campaign. To Oryana for Traverse City’s first and very popular, Neighborhood Compost Station. Who’s next? To Chris Cano and Steven Kanner from Gainesville Compost and Kanner Karts for our 3 Big Boy (or Girl!) trailers. Traverse City is a community full of radness. We’re thankful to be a part of it. Happy Thanksgiving and Compost On! Time To Make The Compost, Traverse City. Posted on October 26, 2014 by Norte! It’s time, Traverse City. Time to make the compost. The leaves are continuing to fall as we type and are begging (yes, begging!) to be sent home in your backyard pile. Follow these simple steps to put those Traverse City leaves to work and grow lots of Traverse City Dirt. 1. First. Go ride your bike. It will make you happy. 3. Collect your kitchen scraps (Greens). Meat and dairy are no-no’s. Dump your scraps into your pile and then cover them up with an arm full of leaves (Browns). 1 part neighborhood Greens + 3 parts neighborhood Browns = Awesome neighborhood compost. 4. Keep layering like a lasagna. Greens. Browns. Greens. Browns. Keep going until you have a massive heap of organic waste. The bigger, the better. Helps it heat up (thanks, Mr. Microbe!) before winter arrives. Not enough Greens in the kitchen? We can help with that too with our Save The Coffee Grounds project. We think coffee grounds make the best Greens, no offense Banana Peels. Read more on that HERE. 5. Rake up more leaves and stash them under your spruce tree. This will keep them from getting buried under the soon-to-be-arriving snow. Trust us, come February, you’ll be glad you did. If you’re feeling super-special nice, you can bag/deliver some leaves for us as part of our #Leaves4Carter program. 6. Go for another bike ride. Free happiness. 7. In spring, harvest your neighborhood compost and use it to grow neighborhood food in your backyard. 8. Give yourself a pat on the back for being a Compost Champion and helping to green our Traverse City. Posted on October 16, 2014 October 6, 2015 by Norte! Here at C’sC World HQ, we believe that if there’s one thing that should definitely NOT go into the landfill, it’s coffee grounds. They’re just too valuable. A fantastic source of Nitrogen. Plus they smell super good! 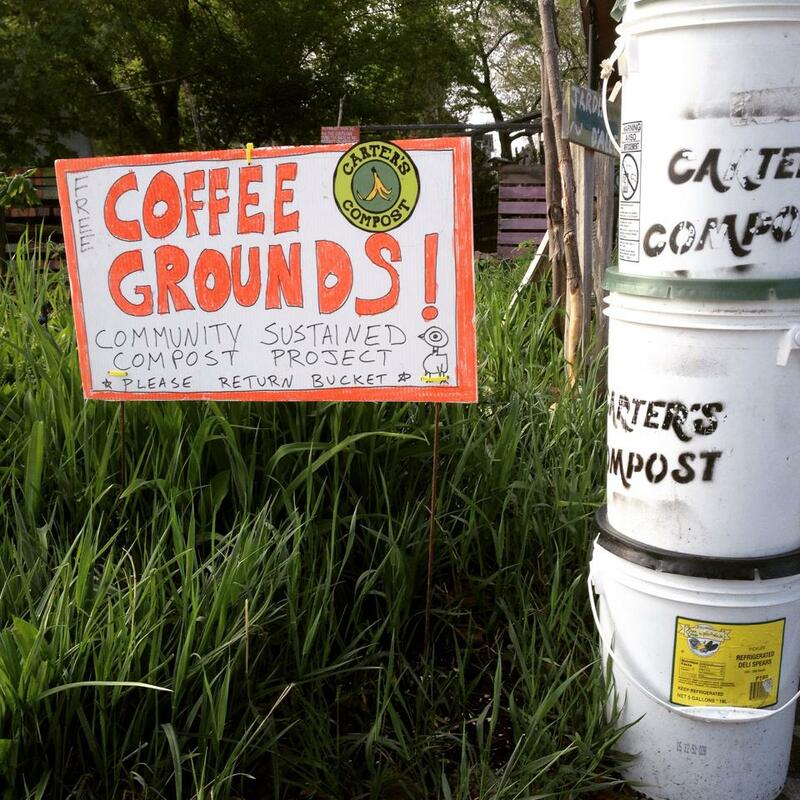 Save The Coffee Grounds is a Traverse City Dirt community project where we are partnering with neighborhood coffee shops to grow more neighborhood compost. More TC Dirt. We are currently helping Brew, Cuppa Joe Drive-Thru, Horizon Books and Morsels compost/recycle/de-landfill ALL of their coffee grounds. That’s a lot of coffee grounds! But, we’re dreaming big and not stopping there. We hope to one day save ALL of the coffee grounds from ALL of TC’s coffee shops. To achieve that goal, we need your help. 1. We will use our bike trailers to transport the buckets of coffee grounds from coffee shops to C’sC World HQ. You will come to the alley (841 Washington) to pick-up the coffee grounds. Buckets also available behind Brew and Cuppa Joe Drive-Thru on 8th..
3. Harvest a bunch leaves from your neighborhoods trees (they’re starting to fall as we type!) to mix in with the grounds. Maples leaves are best. No offense, Mr. Oak tree. If you have extra leaves, maybe you can bag some up and share with us? Read more on our #Leaves4Carter program HERE. 4. Return the empty buckets to C’sC World HQ/Brew/Cuppa Joe and grab more coffee grounds if needed. 5. Build a big heap of leaves and coffee grounds (and other kitchen scraps too) so that come spring, you will have lots of compost to use in your garden. 6. Give yourself a pat on the back for being a Compost Champion and helping to support a greener, more awesome Traverse City.